Dear visitor, welcome to World of Paranoid. If this is your first visit here, please read the Help. It explains how this page works. You must be registered before you can use all the page's features. Please use the registration form, to register here or read more information about the registration process. If you are already registered, please login here. ich finds Lustig & gut gemacht. 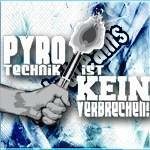 Pyrotechnik Legalisieren - Emotionen Respektieren! Pyro in die Kurve! - damit die Kurve lebt! Polizeigewalt niemals Tolerieren - DFB Ignorieren!